On the 12th observance of 9/11 there are still many questions surrounding the destruction of the World Trade Center buildings. The Official Conspiracy Theory (OCT) put forth by NIST and the 9/11 Commission posits that 19 hijackers (5 of whom turned up alive AFTER 9/11) flew commercial planes in to the Twin Towers and the damage from the impacts of the planes and resulting fires caused the Towers to collapse at free fall speed. These magical planes also caused a third skyscraper (Building 7) to collapse at free fall speed in a vacuum some 25 minutes after the BBC had announced that it had collapsed even though no plane had hit it. Obviously the government’s account is blatantly false. It stands to reason that if the government’s account of the events of 9/11 is not physically possible then it cannot be historically accurate. Historical events on the level of 9/11 shape the future for years, even generations to come. You will not be able to properly understand current events if you do not understand 9/11. Once you come to the realization that the Zionists and Neocons in the Bush Regime acting at the behest of Israel were responsible for 9/11, the wars in Iraq, Afghanistan, Libya and Syria make a lot more sense. The Big Lies of 9/11 have been used to launch wars of Zionist Aggression abroad and erode our civil rights here in the US. The 9/11 Wars have killed over a million innocent civilians and drained the US treasury of trillions of dollars. All so that Israel can maintain hegemony over the Middle East. In recent years these Big Lies have given way to several Alternate Myths. As the OCT loses credibility alternative theories such as nanothermite, directed energy weapons and Big Nukes have tried to bridge the gap. Just as the OCT has imploded so will these Alternate Myths. For anyone who has actually looked at the video sequence of their destruction, however, this theory is easily the least defensible. Gravity operates in one direction: down! But the Twin Towers are exploding in every direction from the top down. The buildings are being converted into millions of cubic yards of very fine dust. And when it was done, there was no stack of pancakes: they were destroyed below ground level! And, even worse, on the truss version, the core columns would have remained standing, like the spindle on a 45rpm record player after the records had been played. The group that dominates A&E911 and produced “Explosive Evidence”–Richard Gage, Steve Jones, Kevin Ryan and Neils Harrit, especially–have insisted that the key to understanding 9/11 is tiny chips of unexploded energetic material found in dust samples from apartments in the vicinity of “Ground Zero”, to which they refer as “nanothermite”. The catch turns out be that nanothermite is a feeble explosive that has 1/13 the force of TNT, the universal standard. Research by T. Mark Hightower, a chemical engineer, moreover, has shown thatit only has a detonation velocity of 895m/s, which is far from the speed of sound in concrete and steel, which are 3,200m/s and 6,100m/s, respectively. Since it is a law of materials science that an explosive cannot destroy a material unless it has a detonation velocity equal to or greater than the speed of sound in that material. You can’t get there from there. In 2002 Jeff Prager tried to prove 19 Muslims hijacked four planes and attacked us. By 2005, he realized this was false, sold his business, left the US and began to investigate 9/11 full-time. (See his 9/11 America Nuked.) In “Proof of Ternary Fission in New York City on 9/11″ he observes (1) that dust samples are the best evidence of what happened on 9/11; (2) that the US Geological Survey samples taken over a dozen locations show how various elements interacted prove that fission reaction(s) had taken place; (3) that Multiple Myeloma in the general population at a rate of 3-9 incidents per 100,000 people, but the rate was 18 per 100,000 among first responders; (4) that other cancers relatively unusual cancers have appeared among the responders, including non-Hodgkins lymphoma, leukemia, thyroid, pancreatic, brain, prostate, esophageal and blood and plasma cancers; and (5) that, as of March 2011 no less than 1,003 first responders died from various cancers. Barium and Strontium: Neither of these elements should ever appear in building debris in these quantities. The levels never fall below 400ppm for Barium and they never drop below 700ppm for Strontium and reach over 3000ppm for both in the dust sample taken at Broadway and John Streets. Thorium and Uranium: These elements only exist in radioactive form. Thorium is a radioactive element formed from Uranium by decay. It’s very rare and should not be present in building rubble, ever. So once again we have verifiable evidence that a nuclear fission event has taken place. Lithium: With the presence of lithium we have compelling evidence that this fission pathway of Uranium to Thorium and Helium, with subsequent decay of the Helium into Lithium has taken place. Lanthanum: Lanthanum is the next element in the disintegration pathway of the element Barium. Yttrium: The next decay element after Strontium, which further confirms the presence of Barium. Chromium: The presence of Chromium is one more “tell tale” signature of a nuclear detonation. Tritium: A very rare element and should not be found at concentrations 55 times normal the basement of WTC-6 no less than 11 days after 9/11, which is another “tell tale” sign of nukes. Indeed, the destruction of the World Trade Center buildings on 9/11 appears to have been a nuclear event. 1/3 of the Twin Towers and a thousand bystanders were completely vaporized. Some 1,400 cars were toasted in the vicinity of the WTC. Chunks of debris were ejected hundreds of yards. No desks, chairs, computers or toilets were found in the rubble of the Twin Towers. Temperatures at Ground Zero were between 600 and 2,000°F for six months after 9/11. The clinchers though are the USGS dust samples and the Department of Energy (DOE) water samples. The USGS dust samples not only show elevated levels of elements such as uranium, thorium, barium, strontium, yttrium, chromium, copper, zinc, sodium and potassium, they show that the quantities of a dozen elements rising and falling predictably over a dozen sample locations. The only process that can explain this is nuclear fission. The DOE collected water samples from the basement of Six World Trade 11 days after 9/11 that contained tritium at 55 times background levels. This proves nuclear fusion took place. Dimitri Khalezov recently published an article where he makes the case that three 150 kt nukes were detonated 100 meters underground on 9/11 (aka the Big-Nuke Theory). In order to maintain the viability of his theory he states that several pieces of evidence including seismic readings, toasted cars and photographs were faked. Our approach has been to come up with a theory that fits the evidence rather than having to claim this photo or that report was faked. The WTC Mini-Nuke Theory explains what was observed at Ground Zero. Khalezov’s Big-Nuke theory simply cannot account for the gross observable evidence. The WTC Mini-Nuke Theory postulates that there were perhaps 5-11 mini-neutron nukes placed the core columns of the Twin Towers as well as several underground mini-nukes. There were a series of underground explosions before each Tower starts coming down. The mini-nukes in the core columns were detonated sequentially from top to bottom and configured to explode upward. The top to bottom demolition sequence was intended to simulate a free fall gravitational collapse which was the cover story. 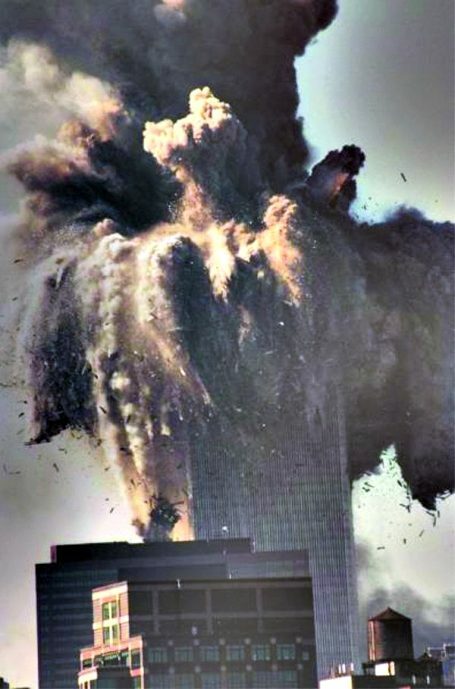 If they took out one cube of 10 floors per second, then the time of destruction of the North Tower would have been 11 seconds and of the South–where the top three cubes tilted and were blown as one–9, which agrees with NIST’s own time estimate.The charges were shaped to explode upward so that the bombs in the top of the building would not destroy the bombs below before they had a chance to explode. Mini-nukes exploding upward also serves to explain the low seismic readings of 2.1 for the South Tower and 2.3 for the North Tower. Some may question whether mini-nukes can be configured to explode directionally. Shape charging explosives has been around for a long time. Friedwardt Winterberg of Cornell University has proposed using deuterium microbombs to transport payloads between planetary orbits. This amounts to exploding mini-nukes in a cylindrical tube to direct the blast to propel the spacecraft. This explains what is observed in the destruction of the Twin Towers: material is being ejected upward and outward, 1/3 of the buildings are completely vaporized, and steel, cement and gypsum are converted into a pyroclastic surge cloud that covers Lower Manhattan in fine dust. Retained heat from the underground mini-nukes produce the high temperatures that persisted for six months after 9/11. Conventional explosives were used as well in the Twin Towers but mini-nukes did the heavy lifting. In the case of Building 6 mini-nukes were detonated in the basement of the building and configured to explode upward. This explains the scooped out crater in the center of the building and the tritiated water found in the basement 11 days after 9/11. Building 7 was also a combination of conventional and nuclear demo charges. Unlike the Twin Towers, no above ground nukes were used on 7. Conventional charges took out the support columns of the building which caused it to fall at free fall speed in a vacuum and three mini-nukes detonated in the basement vaporized much of the contents of the building. This explains the low seismic reading of .6. We will have a full break down on Building 7 in a future article. What Would 150 Kiloton Blasts Have Done? As a comparison to Khalezov’s theory let’s use the Storax Sedan nuclear test which was a 104 kt nuke detonated 190 meters deep. It lifted a dome of earth 90 m (300 ft.) above the desert floor before it vented at three seconds after detonation, exploding upward and outward displacing more than 11,000,000 tons of soil. The resulting crater is 100 m (330 ft.) deep with a diameter of about 390 m (1,280 ft.). A circular area of the desert floor five miles across was obscured by fast-expanding dust clouds moving out horizontally from the base surge, akin to pyroclastic surge. The blast caused seismic waves equivalent to an earthquake of 4.75 on the Richter scale. There were no giant craters observed at Ground Zero in New York so on this point alone Khalezov’s theory can be rejected. The Twin Towers were destroyed from the top down and the inside out. No big flash was visible and no other buildings were flattened by the blasts so by definition any above ground nuclear detonation had to be low yield. Photos and videos of the destruction of the Twin Towers clearly show that there were indeed above ground nuclear detonations. As we can see below the chunks of debris that are being ejected from the North Tower into the Winter Garden originated several stories above the top of Building 7. Other material is being ejected straight up; the North Tower is clearly being demolished by an above ground mini-nuke. The bottom 60 floors of the North Tower are clearly still intact when the material that landed in the Winter Garden was ejected. Khalezov’s account of large underground nukes simply cannot account for the observed top down demolition of the North Tower. The Winter Garden was destroyed on 9/11 from debris ejected from the North Tower. Judy Wood denies that explosives were used to demolish the Towers and that through some unknown process they simply turned to dust where they once stood. This is patently absurd. The Twin Towers exploded and Wood cannot account for a 300 ton chunk of debris being ejected into the Winter Garden 600+ feet out. It was traveling at an estimated 70+ miles per hour. Judy Wood’s DEW non-theory has no explanatory power for the destruction of the WTC buildings and can be rejected. Since nanothermite is not explosive it cannot account for the destruction of the Winter Garden. Nanothermite has no ability to explode concrete or steel or eject steel assemblies weighing hundreds of tons up at a 45° angle and out into the Winter Garden. The nanothermite theory can also be rejected. The Winter Garden is the end of the line for any theory except the mini-nuke theory. EXIT signs, gun sights and cold fusion cannot explain the tritium found in the basement of Building 6. The only thing that can explain this evidence is a thermonuclear explosion. It is apparent that one or more mini-nukes were detonated in Building 6. A 150 kiloton nuke buried under another building cannot account for the damage inflicted upon Six World Trade. Neither can thermite, cold fusion or a Judy Wood style DEW. Ted Twietmeyer’s post on Rense’s website sheds considerable light on the toasted cars. Vector forces show that the source of the EMP that toasted the cars (and neutrons per Ed Ward) is clearly above ground. Khalezov’s Big-Nuke Theory falls short in several areas: It cannot account for evidence of above ground nuclear detonations, low seismic readings of the destruction of WTC-1, 2 and 7, the lack of giant craters at Ground Zero, the destruction of WTC-6 and the 1,400 toasted cars. The WTC Mini-Nuke Theory can account for all of these things without resorting to claiming seismic reports and photographs were faked or that the police and FBI were burning their own cars. Khalezov is correct that the destruction of the WTC buildings was a nuclear event. He is much closer to the mark than are the thermite sniffers and DEW cultists. The time has come to reject all of the Myths surrounding 9/11 and come to grips with what really happened: the Zionist / Neocon Cabal nuked buildings in Lower Manhattan to justify Zionist Wars of Aggression in the Middle East. The Killing Machine will keep going with wars in Syria and Iran if we are unable to reject the lies and myths and face up to the truth of 9/11. Donald Fox has done extensive research on the role of mini-nukes by Dr. Ed Ward and on work by The Anonymous Physicist on the towers and has formulated an account of how it was done and why there is more to this story relative to very low-yield thermonuclear devices. See his blog at http://donaldfox.wordpress.com.